Finned tube is our heat exchanger commonly used in a heat transfer of the original, in these finned tubes, the role of each category of finned tubes are different, today we talk about bimetallic composite finned tube And single metal composite finned tube difference it! The single-metal composite finned tube is made by aluminum tube rolling. It is called aluminum finned tube. It has no contact thermal resistance, high strength, heat resistance and mechanical vibration, good thermal expansion performance and considerable expansion heat transfer surface. With this finned tubes made of heat exchanger, the effect of lead or wound around the chip heat exchanger, is a very versatile heat exchanger. 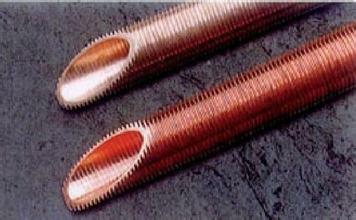 Single-metal composite finned tube can also be directly from the steel pipe rolling or rolling made of copper. Bimetal composite finned tube is divided into steel and aluminum composite finned tube and copper-aluminum composite finned tube. The aluminum-aluminum composite finned tube is composed of (steel tube, aluminum tube; or stainless steel tube, aluminum tube) and then finned by the composite fin, copper-aluminum composite fin tube by (copper tube, aluminum tube) And has the advantages of close combination, small heat resistance, good heat transfer performance, high strength, small flow loss, strong anti-corrosion property, long deformation and long working life under long-term hot and cold working conditions. The whole rolling fin has no burr, no wrinkle and easy to clean. It is easy to exclude the condensed water on the outer surface of the fin in the heating and air-conditioning project, and it is not easy to dust and scale in the drying and heating and other heat exchange occasions.